Why should I calibrate the instrument? How often should I calibrate the instrument? From the 28nd to the 30th of March, in Parma Fairground area, visitors can go around and see 12 thematic shows, which will provide a complete overview on materials, machines and processes in the perspective of a growing industry 4.0. MECSPE is a steadily increasing fair. Suffice to say that last year the organizers optimistically foresaw 40.000 visitors, but at the end of three exhibition days, the visitors’ turnout was of well 53.442 visitors. Last year, the exhibiting companies were 2260. Over 80% of visitors declared to have found Mecspe an interesting fair and not to lose. S.A.M.A. Italia S.r.l. will be present with its rigorously red and blue Booth, in the Metrology and Quality Control Hall, Pav. 3 - Booth G63. This year, we will have the pleasure to promote the new PROMO 2019, about non-destructive and mechanical testing instruments. We have been working for many months in anticipation of this Fair that has always allowed us, year after year, to increase our customers and to improve loyalty of those already acquired. The ticket is free for all business operators and gives you the chance to visit the Fair. Moreover, you will have direct access to conferences and special initiatives. ASK FOR YOUR FREE TICKET TO ENTER THE EXHIBITION WITHOUT HAVING TO QUEUE IN RECEPTION! 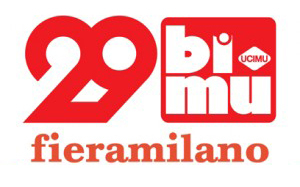 BI-MU Fiera Milano, - Metal forming and metal cutting machines, robots, automation and auxiliary technologies. "SAMA Italia products are becoming increasingly demanded" this is we can noticed from BIMU in which SAMA Italia Srl has successfully participated. There were a lot of requests and appreciations from international companies on all fronts, from roughness testers to ultrasonic thickness gauges, from coating thickness gauges to gloss meters. Each of them has contributed to the success of SAMA Italia Srl in this Biennial of machine tools’ edition. "It has been a very important event, at our stand have been coming visitors from all over the world and we have responded to many requests about our products." This is what reports Mr. Riccardo Zappelli, sales manager of SAMA Italia srl. "The interest has been mainly directed to our lines of roughness testers, ultrasonic meters and hardness testers but also force gauges, test stands and scales have provoked a lot of curiosity. And then, of course, there is always on top our wide range of classic measuring instruments, such as calipers, micrometers and dial gauges”. Thanks to everyone and see you next edition! Send us an e-mail with all your company information and you will be contacted by our Staff! Follow us We'll keep you up to date!